Khao Lak (เขาหลัก) is a beach resort town located in the Takua Pa District of Phang Nga province in Southern Thailand. It is approximately 80 kilometers north of Phuket. beautiful and calm Pakweeb beach – I loved it! I stayed at a resort in Paakweeb beach and I loved this place! Personally, I prefer here than Phuket, there are less crowds. It suits my need then – I just needed to rest my head and calm my mind. If you are tired from all touristy entertainment in Phuket, and want to swap for a laid-back environment, Khao Lak is perfect for you. I also visited Khaolak South and North beaches and Bang Niang beach, the beaches are not so pretty comparing to Paakweeb beach to be honest, but its quiet, soft and sleepy ambiance is truly prominent. If you remember one of the historic natural disasters happened in December 2004, Khao Lak was hit by Tsunami harder than anywhere else in Thailand. The maximum tsunami wave height at Khaolak has been reported to be 11.6 meters. My mom took meand my sibling there to see the scene just a few days after Khao Lak was hit . I still remember seeing big boats in the middle of the road. If you are concerned to visit Khao Lak now, don’t be. An early-warning system has been installed along the affected coastline already. I am like a boat drawn on the beach, listening to the dance-music of the tide in the evening. Now Khao Lak has fully recovered, tourism in Khao Lak has again flourished. There are variety of beachfront resorts from five-star to friendly-to-your-wallet. Khao Lak also offers a wealth of places to go and things to do; waterfalls, trekking, rafting, riding elephant etc. 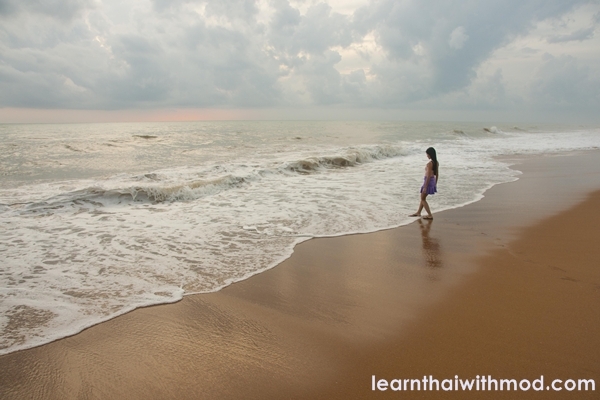 When is the best time to visit Khao Lak? Khao Lak is a seasonal destination. There are two seasons in Khao Lak, the Dry Season which runs from November to April and the Wet Season from May to October. The busiest time is November to February where they have a lot of sunshine and you definitely need to put on the sunscreen. During the rainy months from May to October the room rates are reduced, but also a lot of restaurants and shops are closed. You may be put off by the rougher seas and some beaches may have an undertow and it is not always safe to swim as the sea reacts to the weather. There is no direct flight.The nearest airport is Phuket international airport, then you can take a taxi, a mini van, a bus or rent a car to Khaolak. It is about one-hour drive. From Bangkok: Khao Lak is about 750kms. VIP and first class overnight buses head to Phuket, but you can get off in Khao Lak.Buses depart from the southern bus terminal Sai Tai Mai. The ride takes about 12-15 hours. From Phuket Town: Buses leave heading to Takuapa – you can easily get off in Khao Lak. I want to come to Kao Lak in August with my young son. I read that some restaurants etc close down in the rainy season ? Is Kao Lak still a good place to visit in August ? I have been to Thailand many times so know what to expect but i have never been to Kao Lak before. Mod, have you ever visited Thai Town in Los Angeles or anywhere else in the U.S.? If so, what did you think of it? I have been to the US including L.A. but unfortunately didn’t have a chance to visit Thai town anywhere there. I am sorry I don’t have any opinions to share. I am from Singapore. I like your website very much. Although it’s main focus is on language, it also has history, food, travel, etc. It keeps people ตื่นเต้นเกี่ยวกับประเทศไทย (excited about Thailand, correct me if I am wrong please). Very nice and interesting. Thank you. and… I think you look best with no make-up. Cheers. 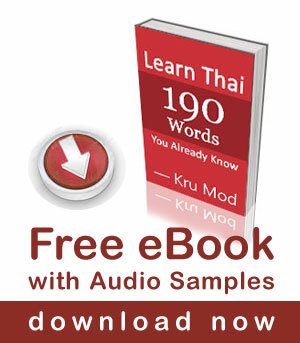 Sawatdee ka James, thank you for your kind words about my website. I am glad you find it interesting. The lotus is truly divine. Mahalo and Sawadeekhrup. Very nice info and now i would like to go there. I have been to Krabi and Bangkok of course and Chiang Mai, Chiang Rai and up to Mae Sai. I am going to Chiang Rai again next week. But if i get bored i think i will fly down to phuket airport and bus over to Khao Lak before i go back to work in Waikiki on May 6.